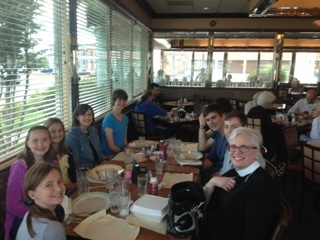 This past St. Francis Day (Sat., Oct. 4), members from the Youth Group along with two adults, including Mtr. Leslie, went into the community to bless animals. After the service in the Memorial Garden, they went to Benjamin Banneker Dog Park to bless some of the dogs. If the owners wanted, they could have either a Christian blessing or a Native American blessing. Most of the owners were happy to have their pets blessed and the dogs were happy to have the attention! Afterwards, the Youth Group went to PetSmart, which was having an adoption event for the Lost Dog and Cat Rescue Foundation. With permission, they blessed pets of people visiting PetSmart as well as from the adoption event. People seemed to appreciate the opportunity to have the blessing. The Youth Group finished off the trip with lunch at Metro 29 Diner. Overall, there was a very positive response from the community!